Newsroom employees at the Morning Call in Allentown, Pa., voted overwhelmingly to join the NewsGuild of Greater Philadelphia, TNG-CWA Local 38010. The 47-person unit joins a wave of organizing at Tribune Publishing-owned publications, marking the sixth recognition win at the company. Workers organized around job security, pay equity, cost-of-living raises, fair and reasonable health care benefits, diversity in all ranks of the workplace, and work/life balance rules that are fair for everyone. 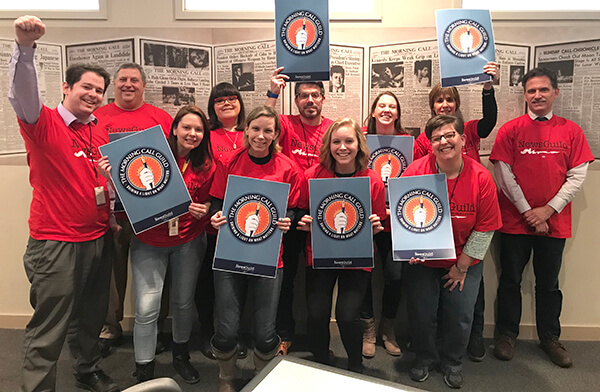 Newsroom employees at the Morning Call in Allentown, Pa., voted overwhelmingly to join the NewsGuild of Greater Philadelphia, TNG-CWA Local 38010.